Dr. Ravi Desai has joined our practice and is accepting new patients at our Kettering and Sycamore offices, beginning on July 1, 2016. 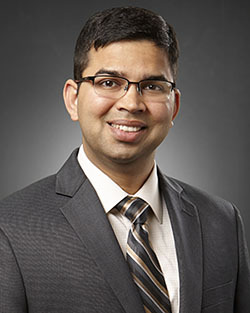 Dr. Desai recently completed a fellowship in Pulmonary and Critical Care Medicine and at Lankenau Medical Center in Wynnewod PA, a very busy and high acuity medical center serving west Philadelphia and Main Line. He is also highly skilled in bronchoscopy with good experience and interest in interventional procedures. PMD is happy to welcome him to Dayton and to our practice! Dr. Desai and his wife, Mansi and daughter Pavitra will reside in Centerville.